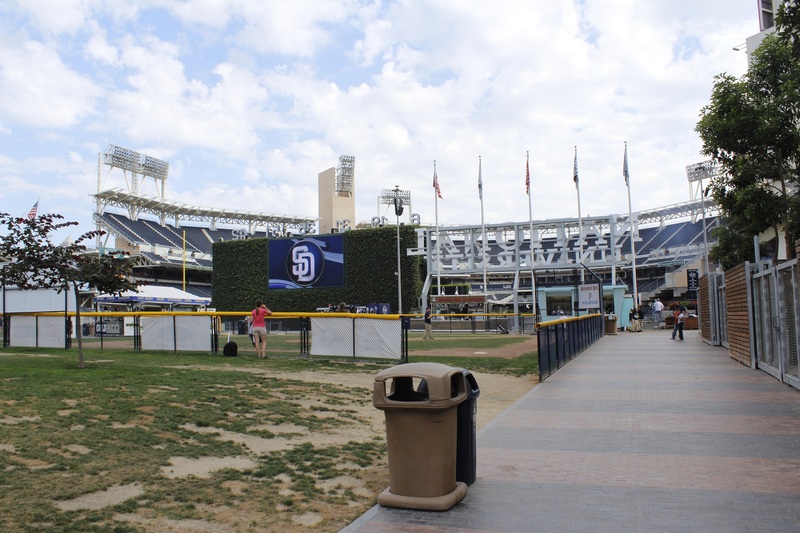 After leaving the greater Los Angeles area, we headed down south to spend a few days in San Diego while waiting for our Padres game. The MLB schedule is always a little tricky so we had to wait for the Padres to come back in town after their away series. While waiting, we spent a few days with my sister and her two friends who were spending their vacations in California. San Diego is a city loaded with attractions. 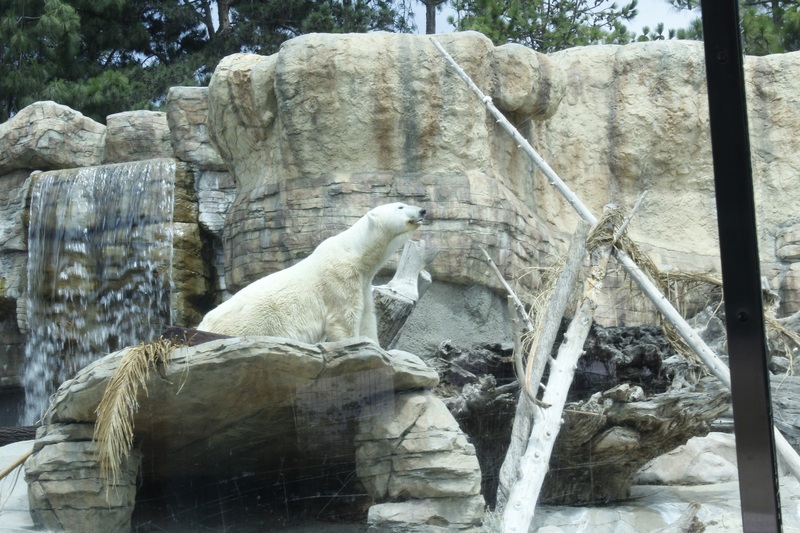 One of the most popular is the famous San Diego zoo. 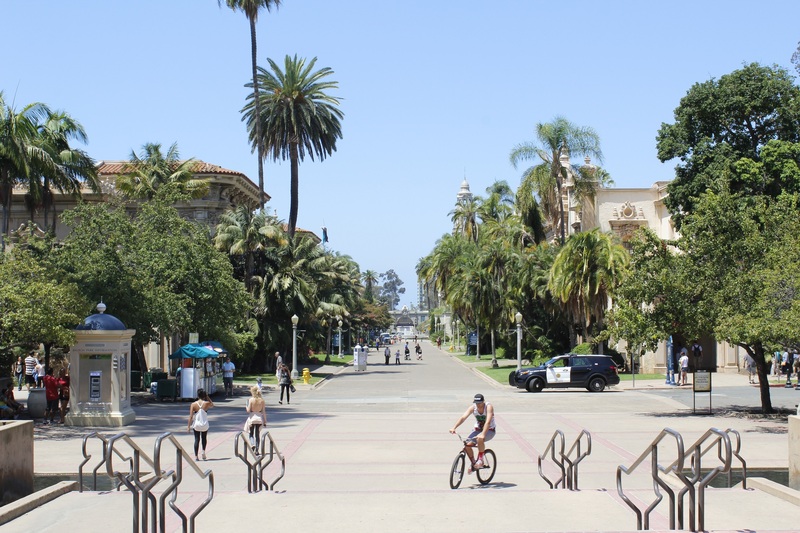 This zoo is located in the Balboa Park and contains more than 4000 animals. 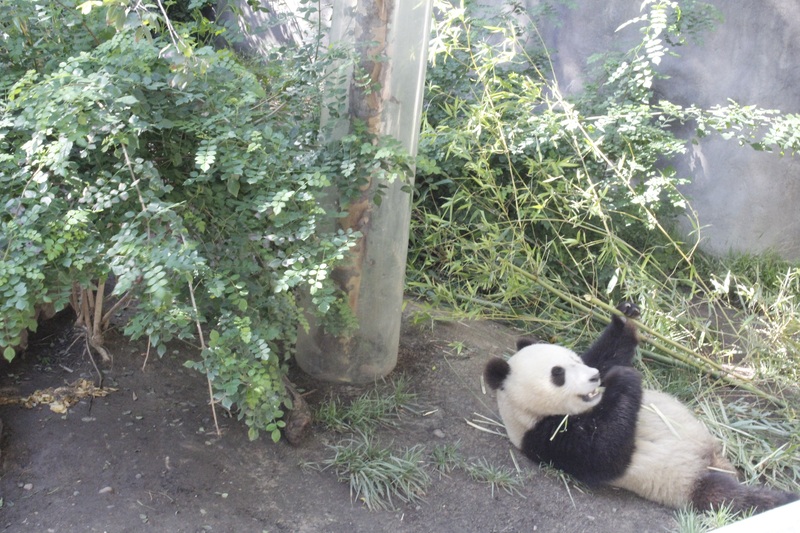 The most popular of these animals: the Pandas (one of the only four zoos in the United States to host this animal), the Koalas and the Polar bears. This zoo is enormous and it is almost impossible to see everything in one day. What a pleasure to see so many different and special animals. The city of San Diego is also known for his Gas Lamp quarter. This historical quarter is really active day and night: restaurants, shops and nightclubs. 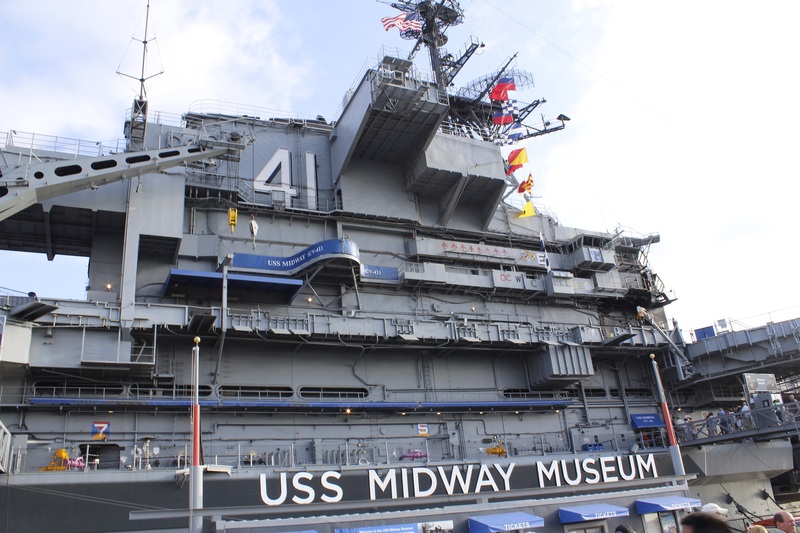 The quarter is located not too far from the waterfront where we can admire the USS midway: an aircraft carrier. San Diego is a key city for the military, especially for the Navy. A big part of San Diego’s Population consists of Military and veterans. In the city, we also visited the famous Balboa Park. 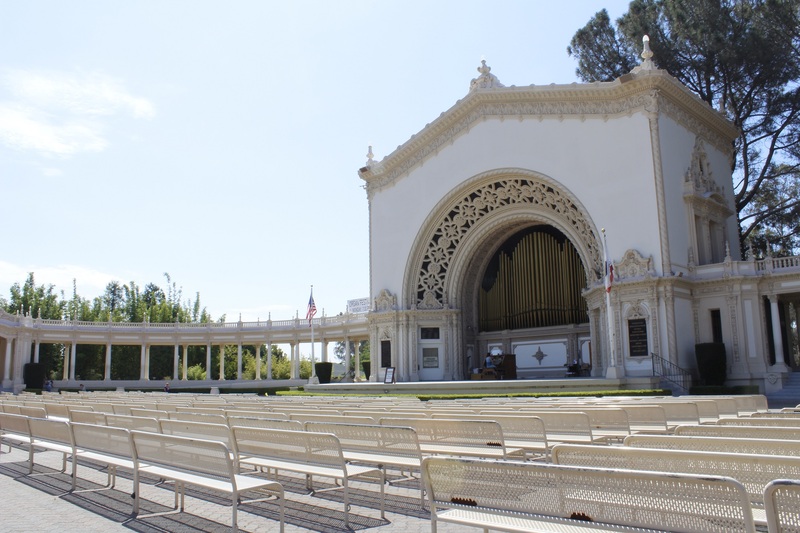 This park of 1200 acres was built in 1868 and was host, in 1915, of the Panama-California exposition. In the park, you can visit 15 museums, nice gardens, the zoo, a Spanish village and the world’s biggest outdoor organ. It is so nice to walk around this park and enjoy the nice south of California weather! Our last visit in the region was the Stone Brewery. 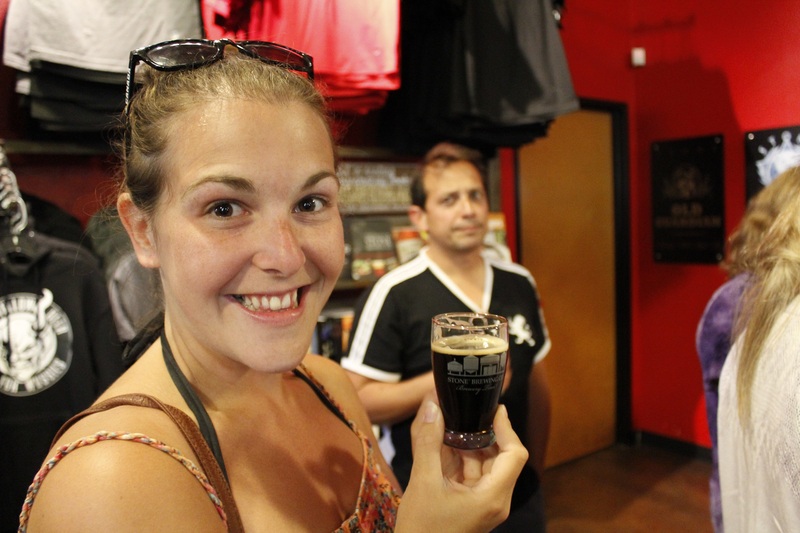 Surprisingly, brewery of distillery visits are some of the cheapest activities we have done (often free or, like Stone, 3$ with a glass and tasting beers). 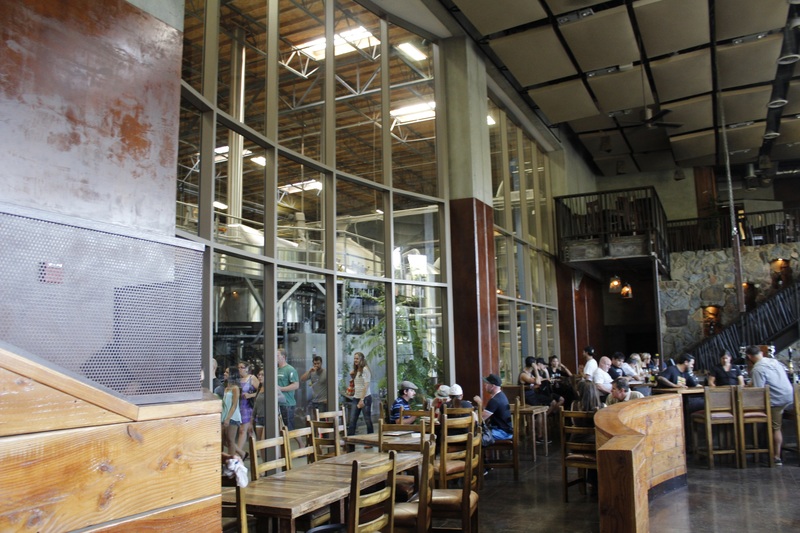 San Diego is the city, in the United States, with the most breweries! The visit is telling us about the history of the brewery and how are they making the beer in there. At the end of the tour, we got to taste four of their beers and we are exiting by their fabulous restaurant. On game day, we walked around little Italy before getting pretty early to PETCO Park. 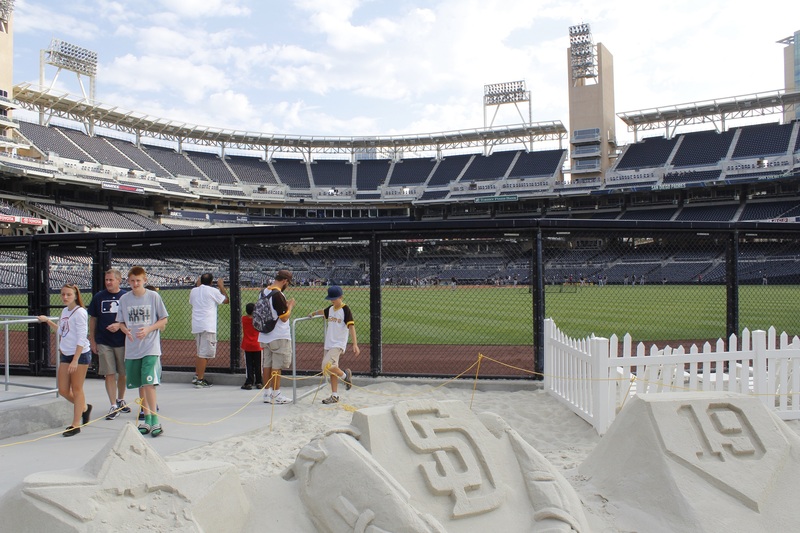 This ballpark was built in 2004 right in downtown San Diego. The team had to buy several buildings around so they could build indoor parking lots. 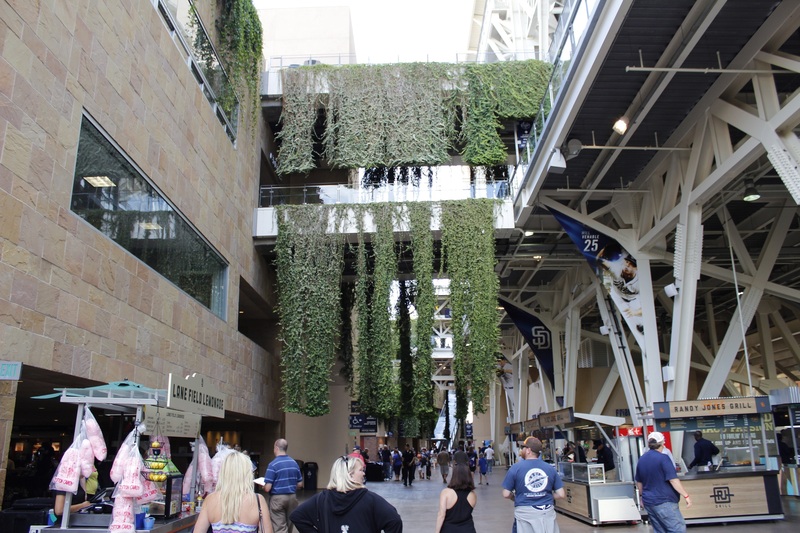 When we got into PETCO Park, we were wondering if we were inside the ballpark or not because it mostly looks like a public park! We checked and it actually is a public park. When there is no baseball, you can just walk by (the stands are closed). In the park, they built a grassy hill so people can sit down and watch the game from this spot. Also the team built a whiffle ball field where kids can play before games. 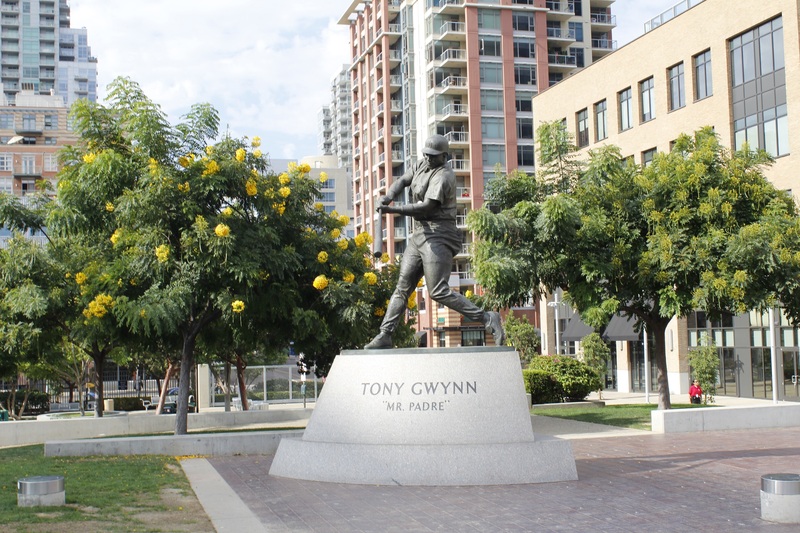 On the top of the hill, the team installed a statue of Tony Gwynn; a great player in the Padres history who died recently (he hit his 3,000th hit in Montreal against the Expos). In center field, the bleachers section is a little different than the ones at the other ballparks. Sitting first row, you will have your feet in the sand! 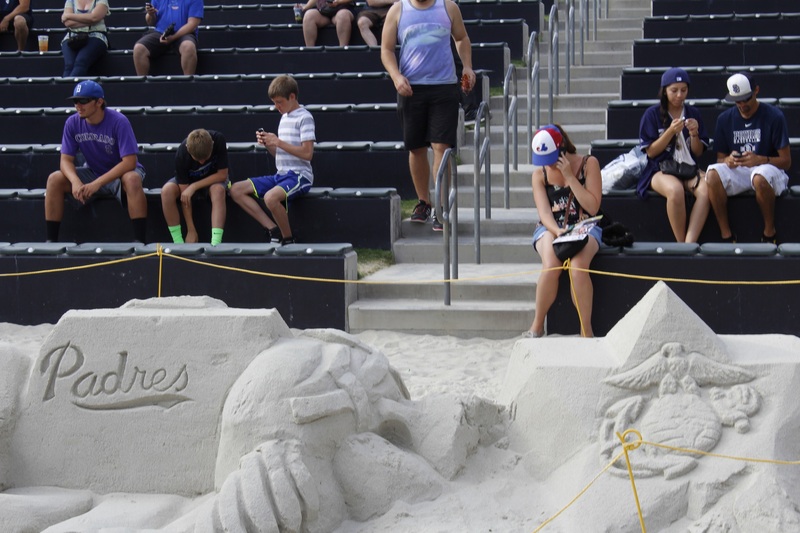 There are a few sand sculptures right next to the center field wall. Sitting in the sand, we observed the Western Metal Supply Co., a building that has been declared historical so it was kept during the construction of the ballpark. It really reminds us of Camden Yards. Inside, there are displays with artifacts found during archeological diggings before the team could build the ballpark. To walk around the ballpark is breath taking. There are so many different features that are unique to this ballpark that we will probably forget to talk about some of them! One of the great features is the beer choice variety. We are talking here about craft beer variety. They are selling a lot of beer from the San Diego area and at a reasonable price for a beer at a baseball game. On the main concourse you could walk in a small grocery store where you can buy food that would make a change from the usual hot dogs or nachos. 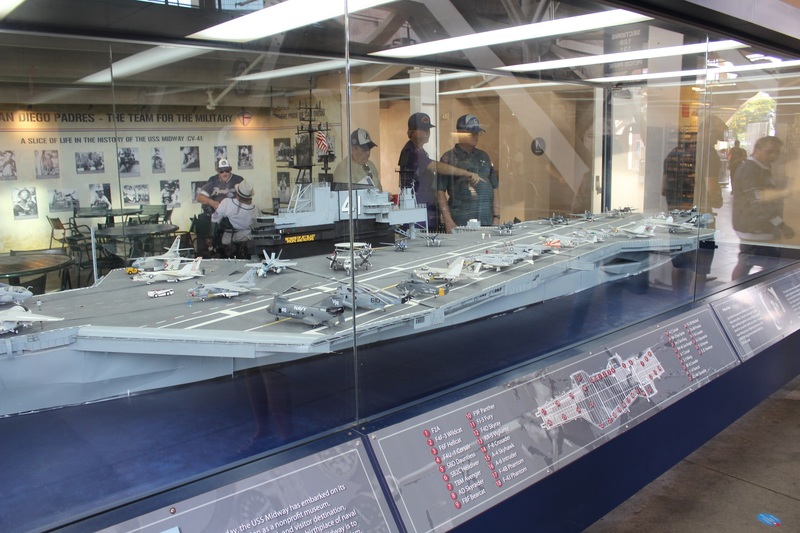 We talked about the USS Midway: also on the main concourse, we could observe a smaller replica of the boat. Next to the boat, the Padres are honoring all the MLB players that fought overseas for the US Army. 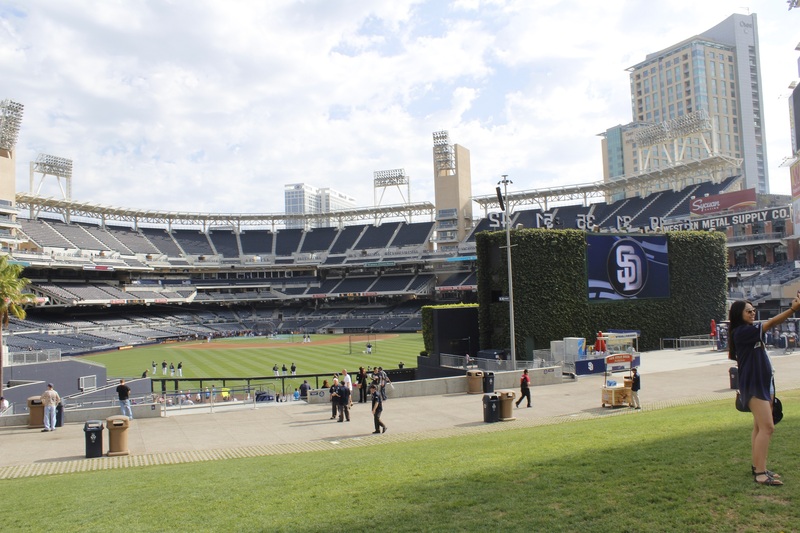 Almost all of the ballpark concourses are open air: it rarely rains in San Diego. We had great seats on the upper deck right behind home plate. For the pre-game show, over 700 kids from the San Diego area where on the field, impressing! There were 28,000 people in the stands for this game and we observed the fans around us and most of them were taking great interest in the game. People wearing the Padres colors and cheered for the team (not to loud but still). The Padres (pitcher: Jesse Hahn) were playing the Rockies (Pitcher: John Lyles). We only had a few base hits to get excited for during the first innings. The teams couldn’t get the players home. We had to wait for the 4th inning when Yonder Alonso hit a solo home run (1-0 Padres). When the Padres get a home run, fireworks and fire beams are coming out of center field. In the 6th inning, the Rockies would also get a home run (Corey Dickerson), but with two man on bases. They would take the lead 3-1. In the 7th inning, the Padres would get closer on a sacrifice fly (3-2). In the 8th inning, Yangervis Solarte, recently acquired from the Yankees, would hit a 2-run home run and the Padres would take the lead 4-3. Kevin Quackenbush and Joaquin Benoit would come to close the books in the 8th and 9th. Benoit would get 3 strikeouts. Padres will win the game 4-3. 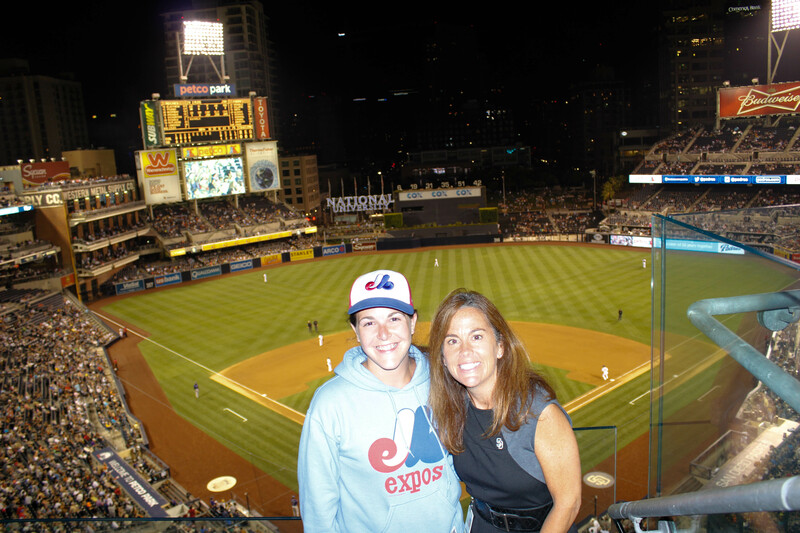 During the game, we had a visit from Sue Bottos: Community relationships vice-president for the San Diego Padres. She answered our many questions about the team and the ballpark. First of all, like we mentioned it earlier, we tough that this park was similar to the Camden Yards in Baltimore. Sue explained us that people that worked for the Orioles when Camden was built eventually came to work for the Padres and helped to build Petco Park. We also talked about how the Padres were caring for conservation of the historical parts of the city like the Wester Metal Supply Co. Building. Something also really important for the team is the fan experience. She told us that there are not a lot of fans that will stay to their seats for the whole nine innings. This is why the organization focuses on different things like the Park in the Park (Public Park behind center field) and the choice of food and beer at the concessions. Like we said earlier, a big part of the population in San Diego consists of active military and veterans. The Padres love to focus on special ceremonies to honor them. They also produce a line of clothing with ‘’military’’ colors. We asked sue if San Diego was a Baseball city. She told us that people in San Diego are more focused on the San Diego Chargers, their Football team. 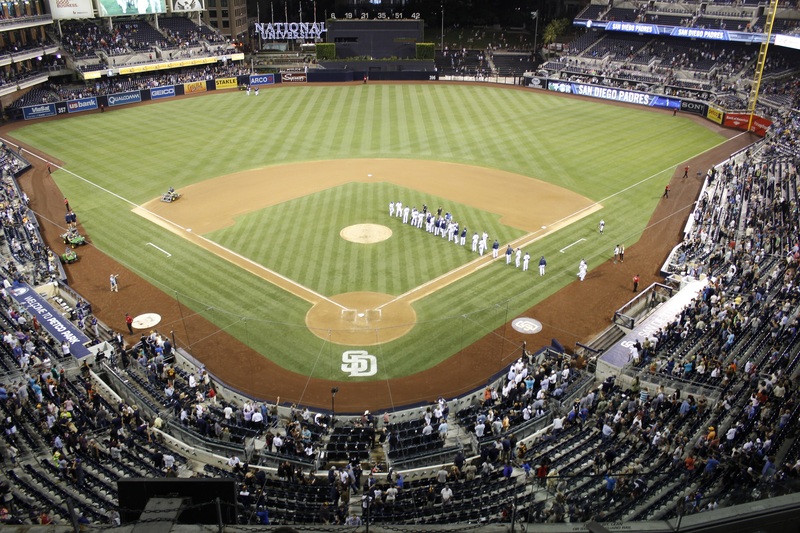 Even tough, with a great experience at the ballpark, the fans will still show up for the Padres games. Sure attendance is lower when the team is having bad years but we are not talking about dramatic numbers. 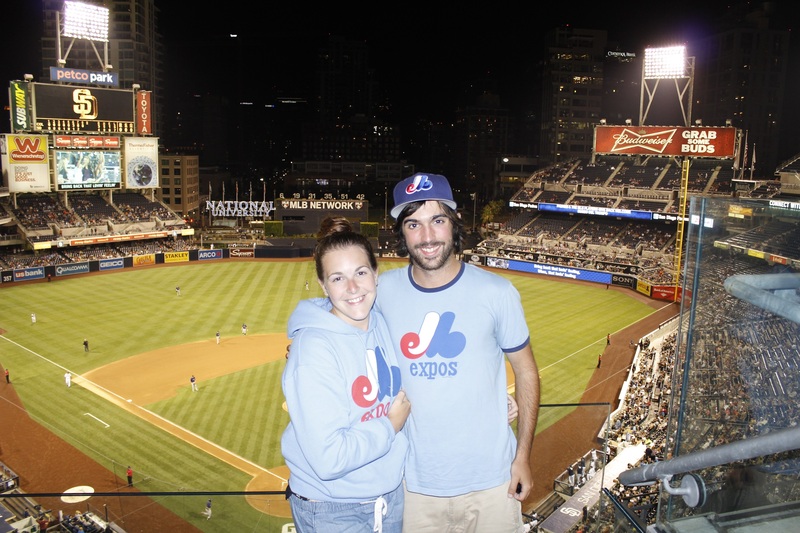 The Padres were born at the same time as the Expos and they survived even if they haven’t won a World Series yet. Sue gave us some Padres shirts and hats! Thanks a lot to her for taking the time to talk with us, it was a pleasure to meet her! 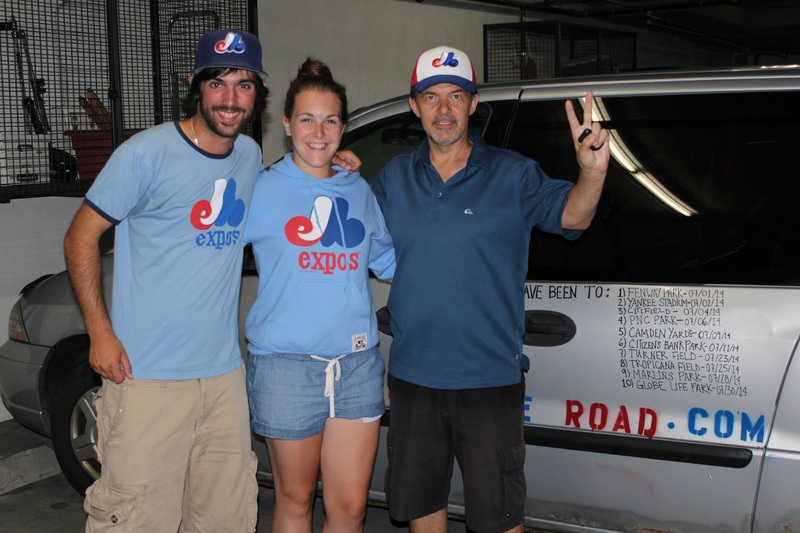 After the game, we met up with Pat, a Quebecer and former Cirque du Soleil worker who moved with his wife to San Diego. Pat and Michelle invited us to eat and have a drink at their place after the game. They also offered us to stay there for the night. Pat was at the game: a ticket to go sit in the Park behind center field only cost 10$ and you have a nice view of the game. We asked him why people love to live in San Diego. First of all, the weather is a big thing: it almost never rains out there! Also, you could find anything you like out there: good restaurants, nice libraries, festivals (the famous Comicon) etc. Pat lives next door to the ballpark. He told us how the neighborhood was almost empty before the construction of the ballpark. Condos towers and nice restaurants are a direct effect of the construction of Petco in Downtown San Diego. Not to forget that the city owns the park at 70%. The city is also looking to build a new football stadium in downtown. Pat offered us some great wine that night and a good café and croissant in the morning. Thanks a lot to Pat and Michelle for hosting us. It is really interesting to have the opinion of a Quebecer living in the United States. It’s too bad to see that out of the four teams of the 1969 expansion (Expos, Padres, Royals and Pilots), only two are still out there. A team went back to Seattle and we hope to have the same thing in Montreal. How did San Diego survived? We cannot explain it only with the ballpark since it is only 10 years old. 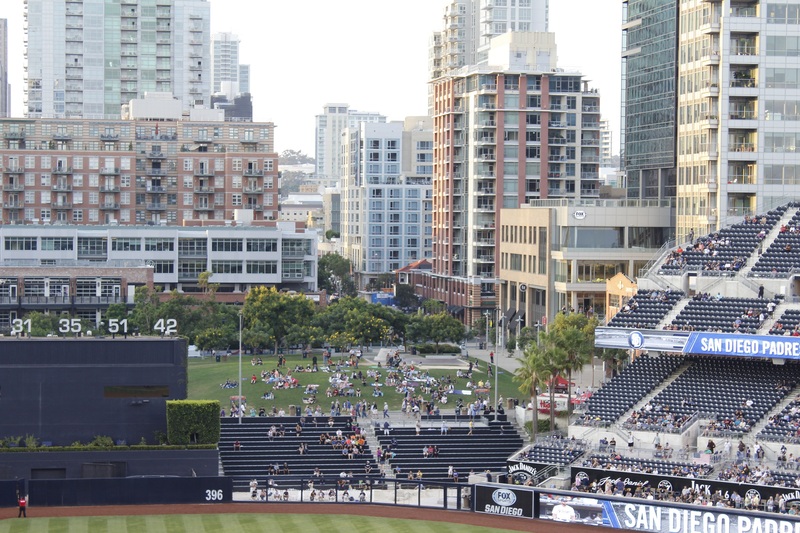 San Diego is a place where people love to go out and to watch baseball outside. The ballpark in downtown is a really nice thing if you want to grab a drink before or after a game. 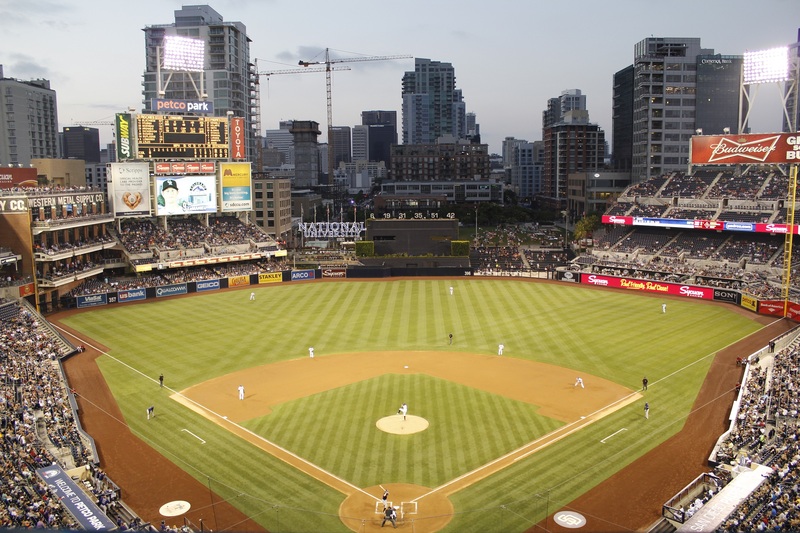 In the last years, the Padres got in average a little more than 2 million at their games per season. 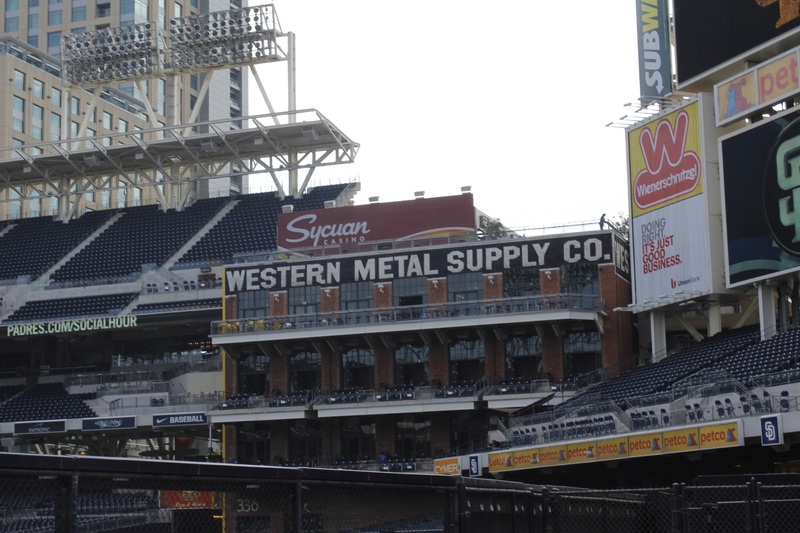 The proximity with the city and the fan experience are the two most important aspects we will remember from PETCO Park. Montreal could learn a lot from this franchise: the weather is different both the population is similar. We are leaving San Diego with a lot of great memories. We will be back at this ballpark in our lifetime for sure. Thanks a lot to Sue for talking with us and a big thanks to Pat and Michelle for hosting us for one night! We’ll take a few days in Las Vegas and our next stop will be San Francisco. P.S. Did you know that the team name: Padres means Father in Spanish? This is why the team mascot, the Swinging Friar is a Monk!